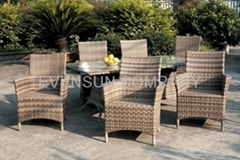 EVENSUN company limited is leading manufacturer focus on producing high-quality outdoor furniture,especially in the rattan furniture. Our furniture series include leisure sofas, indoor and outdoor dining tables and chairs, coffee tables, sun beds and rocking-chair etc. Artificial rattan series are weaved with steel, aluminum, plastic mainly.The artificial rattan furniture is made of the most durable PE. 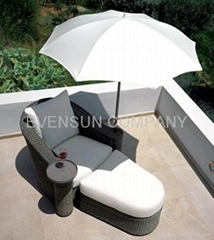 The PE rattan has superior endured for bend, aging and UV radiation. The main structure is made by aluminium tube. It's light and strong. The oxidation surface of aluminium tube has defile-resisting and antirust characteristic. Our artificial rattan series are elegant, vogue and novel, and hundreds of product all designed by known artificer. All they are weaved pure handcraft by well-skilled artificer. Because the material is made by ourselves, the quality can be ensured and the price is competitive. Our products sell to East Europe, North America and else, and all of them are favored by customers. We believe the high-quality products and package, special design, favorable price and best service will bring us mutual benefits. We hope to establish business relations with you for a long time.